Part 2 of our journey began at the Kirk Creek Campground on the shores of the Pacific Ocean, just south of Big Sur. After being lulled to sleep by the sound of the surf, we awoke refreshed and ready to go the next morning – sort of. On one hand, we were eager to see and explore what lay ahead. On the other, we could have easily stayed at the Kirk Creek Campground for many more nights. Even though it offered no services, the setting and scenery were spectacular. About 100 feet below us lay a virtually deserted beach just begging to be “combed” while across the road, several trails leading to stunning views and vistas were begging to be hiked. Eventually, curiosity (the desire to explore what lay ahead) won out over contentment and we continued north along the coast to the village of Big Sur. With a permanent population of less than 1000 which could easily balloon to double or triple that number with tourists on any given day, Big Sur was an interesting community. For services, it offered few such as a store, a gas station or two, a couple of restaurants, hotels and campgrounds, all spread out along the highway. While the area was attractive, some merchants seemed to think that was justification enough for gouging visitors. Stopping at one of the gas stations, I discovered that prices were $3.00 a gallon higher than comparable rates further south. Ouch! 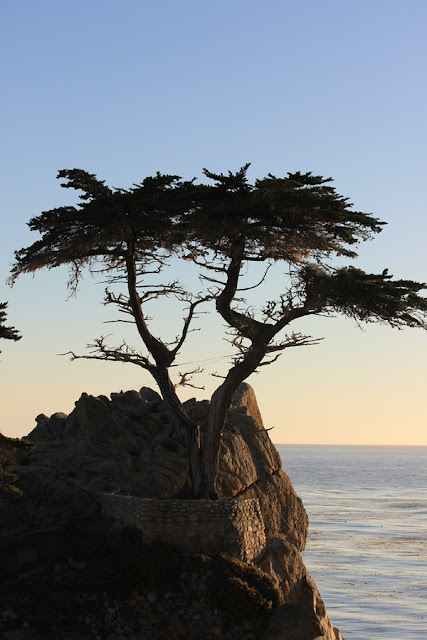 40 miles further north was the community of Carmel By The Sea, famous for its artistic and romantic ambience. The town was indeed lovely, filled with galleries, boutiques, funky shops, a variety of restaurants and a beautiful white sand beach at the western edge of town but, RV parking was an issue. We eventually found a spot on a residential side street, more than a mile from the town center. As we walked downtown, I spotted a real estate “For Sale” sign and took one of the information sheets. Maureen and I often enjoyed looking at property listings while travelling. It was fun to dream about where we would live should we ever win the lottery and join the ranks of the idle rich. The particular house on offer was not that large, more like a summer cottage then permanent residence and sat on a smallish lot. 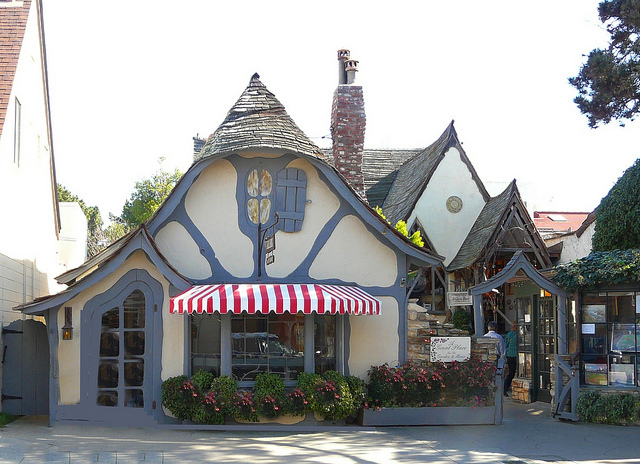 It was however, located just across the street from Carmel’s beautiful white sand beach. Eight million dollars was the asking price. Make that two lotteries. 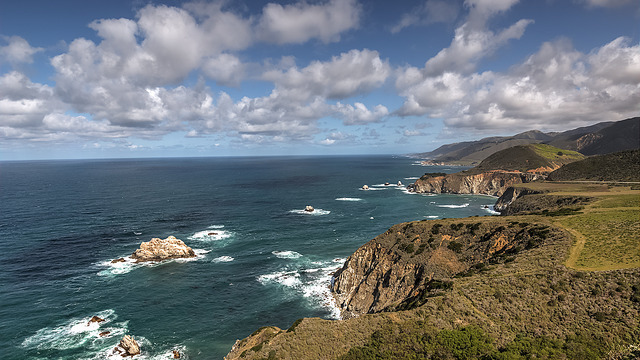 To be honest, after driving along the central coast through Big Sur, I was underwhelmed by the Pebble Beach landscape, especially after paying a $10.00 toll to access the “17-Mile Drive”. The rocky coastline was scenic enough but hardly stunning. What gave the area its cachet or appeal was the renowned Pebble Beach Golf and Country Club, located near the end of the drive. Not far from the country club, I spotted another “For Sale” sign and stopped to grab an information sheet. This time, the property on offer was about two acres in size with a 3000+ square foot, non-descript looking house plus a triple car garage and guest cottage. There was an ocean view of sorts, mostly obscured by trees. A section of the property fronted onto the 17th fairway of the main Pebble Beach golf course which I suppose, was a big deal for golfers. Big enough that the asking price was just shy of forty million dollars! For that price however, the perspective purchaser was also eligible for membership consideration to the Pebble Beach Golf and Country Club. 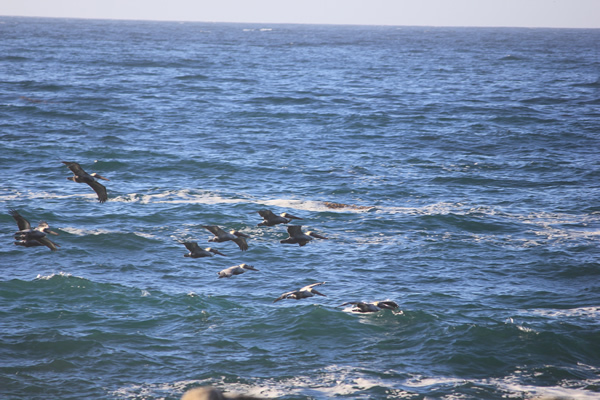 With our peek at the high life over, we continued north on Highway 1 around the shores of Monterey Bay. 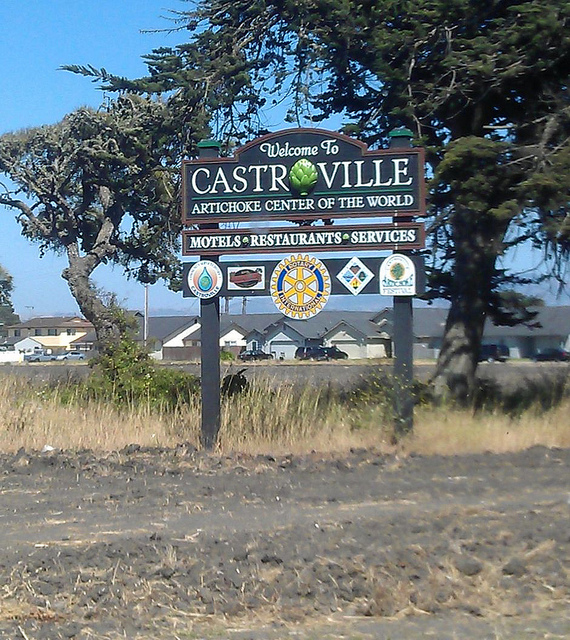 North of Pebble Beach was the highly developed agricultural areas of Castroville which claimed to be the artichoke capital of the world and Watsonville which claimed dominion over no particular fruit or vegetable. 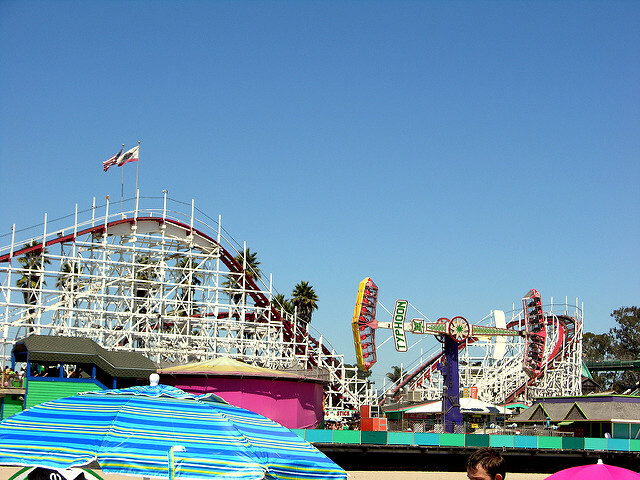 At the northern edge of Monterey Bay was the city of Santa Cruz and its famous amusement park. Naturally, this community was also blessed with beautiful beaches, populated by surfers, swimmers and sun bathers. 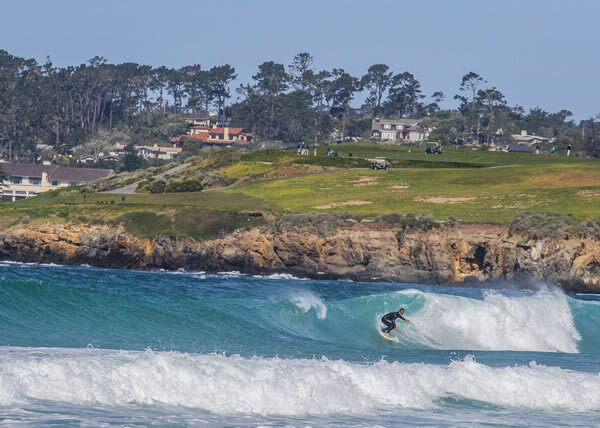 Some things don’t change when it comes to California coastal communities. What had changed however was the landscape. Gone were the rugged hills and rocky coastline of the central coast area. The landscape here seemed flatter and less dramatic. The rocky outcrops along the coast had all but disappeared as well. 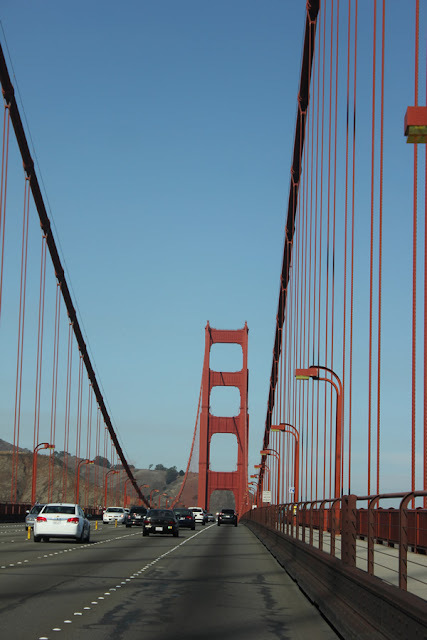 Without realizing how far we’d come, we found ourselves driving through the outskirts of San Francisco. 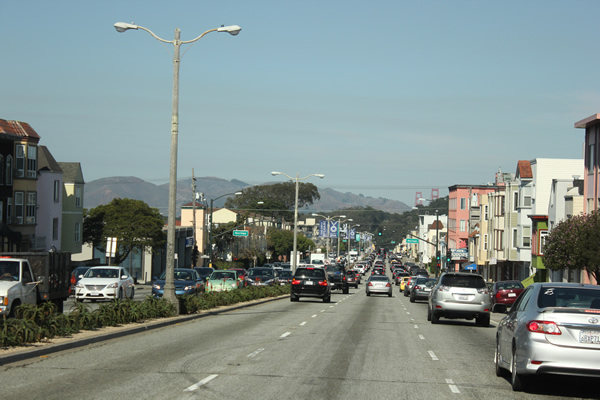 With no other option close at hand, we stayed with Highway 1 as it followed various city streets and boulevards across the metropolis. Luckily, it was Sunday afternoon so traffic was light and no one seemed in a hurry. 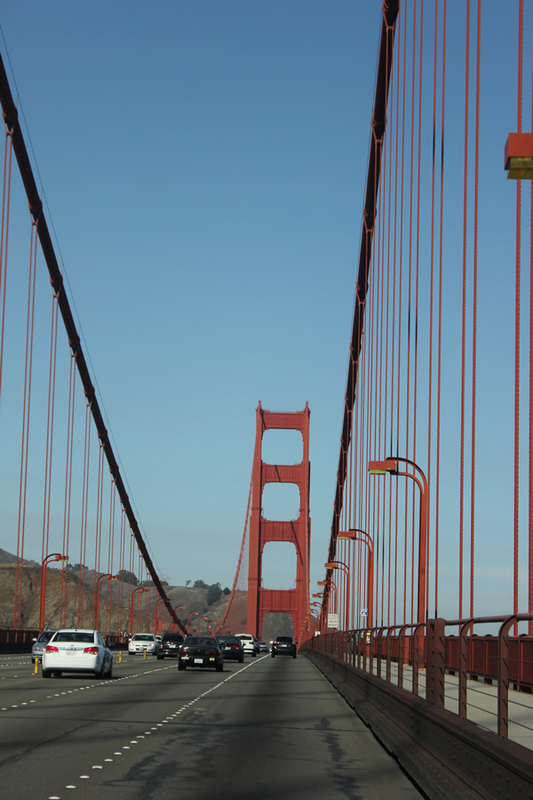 Eventually, we emerged at the north end of the city and crossed the Golden Gate bridge. Really! Our truck and trailer were more than 50 feet long. Naturally, there was no place to turn around or even pull over. Our only option was to continue. For the next half hour, I proceeded slowly and carefully over some of the most narrow and winding roads I had ever encountered. “White knuckled” does not begin to describe my emotional or mental state. By the time we reached the coast, where the highway widened out and straightened out a bit, I was ready to kiss the ground - had there been a place to pull over. We had survived that terrible trip without incident or injury. Perhaps the Travel Gods really do smile on fools and RV drivers who don’t plan their routes well. 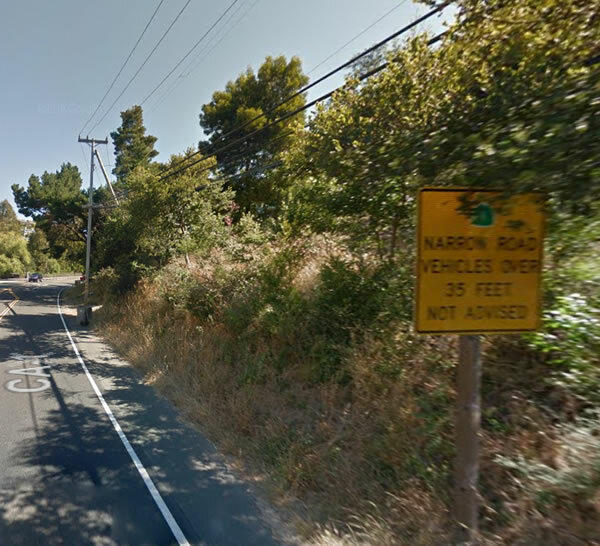 By the time we reached Point Reyes Station, a small community about 40 miles north of San Francisco, my breathing and heart rate had returned to normal. 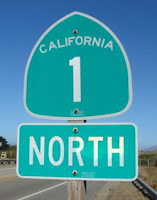 Usually we ate most of our meals in the trailer but our Highway 1 “deliverance” called for a celebration – dinner out. Satiated and soothed after a resplendent repast, we considered our options. Normally, we’d be off the road by now, set up in a campground or RV park but, the “pickins’ were slim” in this part of the country (I wonder why?). That left no choice but to keep going. As night fell, my apprehension rose. 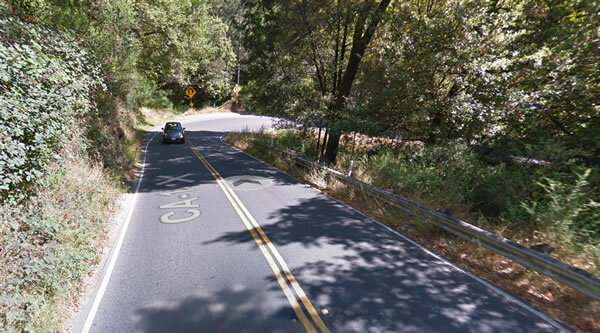 The idea of driving over a narrow, winding, two lane road after dark was not appealing. When I saw the turnoff to Fort Ross State Historic Park, about 60 miles north of Point Reyes Station, I took it like a drowning soul grabbing for a life ring. The plan was to stop there for the night, despite numerous signs prohibiting overnight camping. No sooner had we parked then a white Jeep driven by a Park Ranger pulled up. He politely but firmly informed us that we couldn’t stay but did suggest a couple of campgrounds just up the road. The first one we tried, “Stillwater Cove Regional Park” was full. My wife and I must have looked desperate because the camp host allowed us to use one of the sites normally reserved for disabled campers. We were so happy to be off the road and safely parked that we flopped into bed without bothering to unhook or set up. The next morning, the rising sun matched our rising spirits. Perhaps the worst was over. 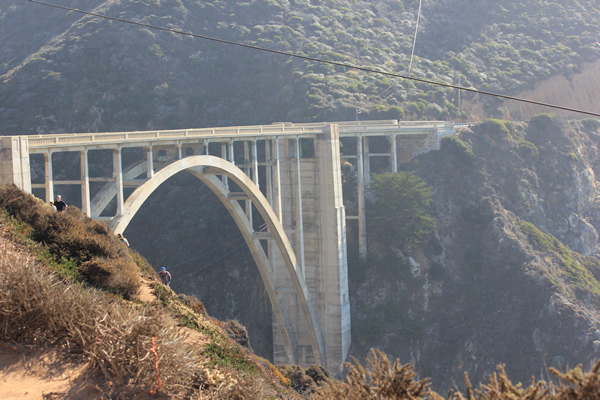 Other than the section north of the Golden Gate bridge, Highway 1 had been challenging but not terrifying to navigate with a truck and trailer. The North Coast region however, seemed less developed and touristy. 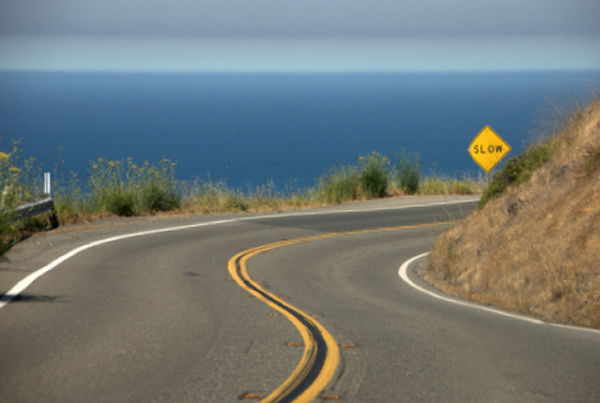 Would that turn out to be a good or bad thing - as in more narrow, winding, twisting roads? Heading north again, we were treated to more spectacular coastal views. The landscape had changed again. While there were few mist covered mountains dropping dramatically into the sea, most of the topography consisted of a relatively flat plain, several miles wide in places that separated the mountains from the coastline. While not as dramatic as the Central Coast, it was striking and spectacular in its own way. And, even on this part of the California coast, there were no lack of beautiful sandy beaches. Two hours north of our campground was the charming community of Mendocino. Located on a rocky headland, this picturesque settlement was renowned for its Victorian style architecture, artist community, galleries and shops. A few miles further north was the town of Fort Bragg. 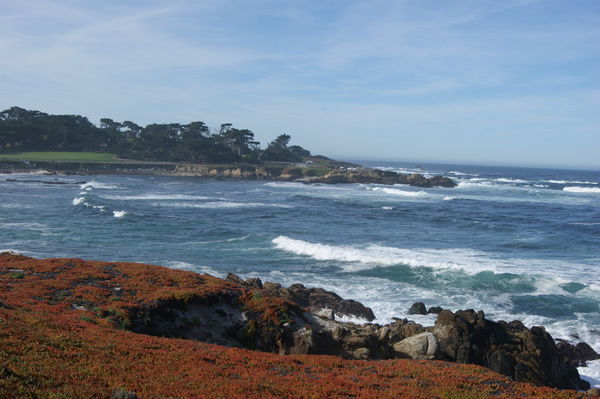 Referred to as, “Mendocino’s ugly step-sister” by a Lonely Planet travel guide, there was little that was quaint or pretensions about this “berg”. Once a lumber and fishing center, the town was gradually reinventing itself as a tourist destination. It was a work in progress. Arriving from the south, we were treated to several roadside malls filled with big box retailers, chain stores and fast food restaurants. The downtown however, had retained much of its original character with trendy restaurants and brew pubs rubbing shoulders with marine supply stores and logging equipment vendors. Past Fort Bragg, Highway 1 continued to wind its way along the coast line before finally heading inland to the village of Leggett where it ended. This last section was one of my favourites. The scenery was amazing. Miles of beautiful, unspoiled, stretches of white sand punctuated by the occasional rock outcrop, lined one side of the road. On the other stretched peaceful, pastoral fields, meadows and hills. Settlement was minimal and traffic almost non-existent. It was as if we had the whole place to ourselves. As an added bonus, long, wide, pull-offs were plentiful meaning we not only had the place to ourselves but that we could actually stop and enjoy it. Alas, all good things must come to an end and that included Highway 1. With the coastline fading in the rear-view mirror and the end of the road ahead, it was hard not to reminisce and reflect on the past 4 days. 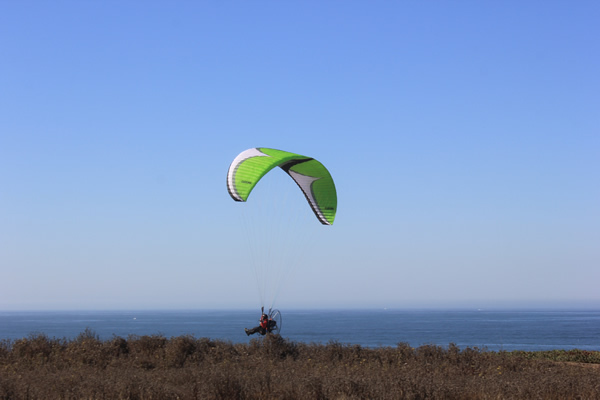 The scenery, the landscape, the rugged coastline, the ocean views had all been breath-taking. Pictures, postcards or videos didn’t do it justice. As for driving however, Highway 1 was much better suited to sports cars, convertibles or even camper-vans than big rigs like travel trailers or motorhomes. While it was do-able, it was not always enjoyable. Despite the challenges of driving the route in an RV, my greatest regret was the inability to pull-off and park at so many of the sites and attractions along the way. 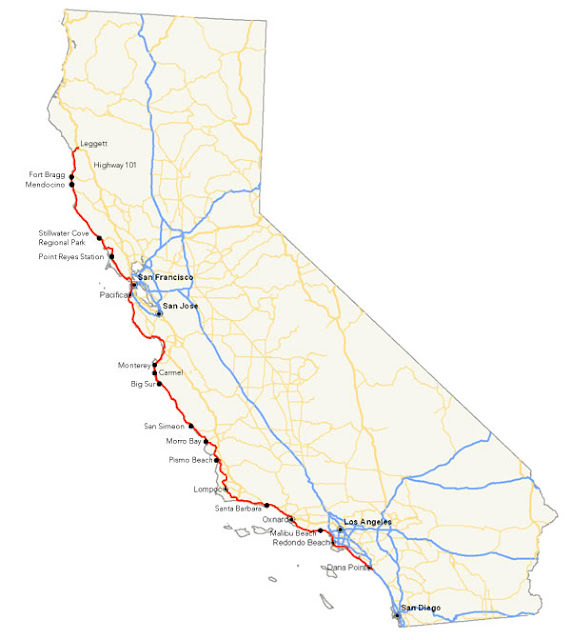 Places like the beautiful white sand beaches south of LA, the Julia Pfeiffer Burns State Park near Big Sur, the Point Reyes National Seashore north of San Francisco, the famous “Glass Beach” near Fort Bragg, or countless other interesting attractions, museums, restaurants, and establishments along the way. We had to give them all a miss because there simply wasn’t space enough to stop and park. Were I to do it again, (which I hope to in the future) I wouldn’t drive the whole route, at least not while pulling a trailer. Instead, I’d pick key locations along the way and use those locations as a base from which to explore. And, I’d allow myself a lot more time for exploring, like 40 days instead of just 4. Even then I suspect, it would not be enough to discover all the wonders waiting to be found along this amazing Route Less Travelled.